El Segundo, California – January 26, 2017 - Version 13, the first major update in 2017 to NI AWR Design Environment, has been released. V13 provides key new capabilities and major enhancements to better address the design challenges associated with highly-integrated RF/microwave components commonly found in communications, phased-array radar and other electronic systems. NI AWR Design Environment V13 introduces numerous innovations in design flow management and simulation, supporting monolithic microwave integrated circuit (MMIC), RFIC, multi-chip module and printed circuit board (PCB) technologies. Simulation capabilities have been expanded within the Microwave Office APLAC harmonic balance (HB) and Visual System Simulator™ (VSS) system-level simulation engines and speed improvements have been made to both its AXIEM planar 3D and Analyst™ arbitrary 3D electromagnetic (EM) solvers. Design automation and simulation have been enhanced for multi-chip modules, with greater support for multi-technology process design kits (PDKs) within a single project, new support for OpenAccess (schematic) databases and APLAC co-simulation support for Spectre RFIC netlists, as well as simplified EM layout and port creation. For PCB design, a new import wizard supports ODB++ and IPC2851 databases to provide interoperability with mainstream third-party PCB layout tools. New layout editing capabilities have also been added, along with simplified multi-technology management. Furthermore, the new EM Socket II architecture within V13 offers improved third-party EM simulation flows for AWR Connected™ partner solutions from ANSYS, CST and Sonnet, giving designers access to alternate EM simulators within NI AWR Design Environment. V13 addresses specific system requirements with highly accurate simulated RF front-end component measurements provided through new communication libraries for 5G candidate modulation waveforms and phased-array behavioral model enhancements. RF power amplifier designers can now use the system-level load-pull analysis in VSS to generate contours for communication performance metrics such as adjacent channel power ratio (ACPR) and error vector magnitude (EVM). RF filter designers can take advantage of new capabilities in the iFilter™ synthesis tool to accelerate their product development and designers of passive and control components such as transformers, couplers and mixers can benefit from the new synthesis capabilities and powerful new optimization methods using proprietary genetic algorithms for more robust designs. In addition to design automation and simulation enhancements, user support has been expanded to bring new insight to the software in terms of interactive guided help and knowledge base content. For more detail on NI AWR Design Environment V13 visit awrcorp.com/whatsnew, which provides documentation covering the hundred plus enhancements/additions to this latest release. 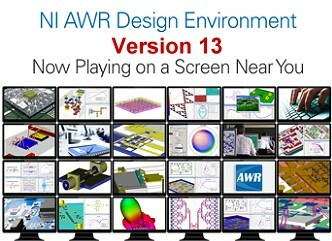 NI AWR Design Environment V13 is available immediately for current customers. Contact your local NI AWR software representative for more information, as well as licensing and pricing details.